Financial Market Vigilante: Lending Activity Heats Up – Should Stock Investors Worry? Lending Activity Heats Up – Should Stock Investors Worry? One aspect of the recent U.S. economic growth not widely recognized is that it is being fueled by renewed high levels of debt being taken on by consumers, businesses and investors. Unsustainable debt levels are notorious for derailing GDP growth. This phenomenon was evident prior to the last two stock market peaks, and the risk has returned to the U.S. market once again. If you review the statistics shown in the table below, you will see that just like 2000 and 2007, debt levels in 2014 have risen to warning zone levels relative to the size of the U.S economy (red = historically high, yellow = approaching historical high levels). The most unsettling statistic is the renewal of the long-term trend in which consumers are taking on an ever greater share of debt which fuels GDP over the short term, but eventually leads to a sharp downturn economically because at the same time their income level to pay off the debt is shrinking. 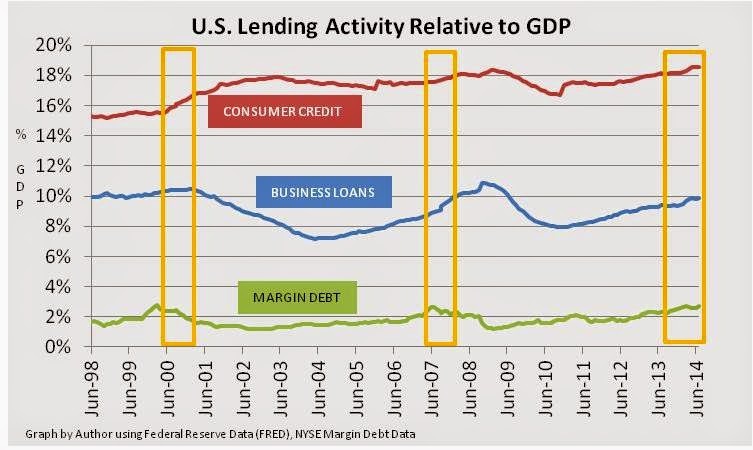 This trend dates back to the early 1990s when consumer credit outstanding measured in the 12% of GDP range versus 18.57% today. Not coincidentally, this point in history is marked by the explosion in growth of emerging market economies like China and India as part of the "New World Order" U.S. foreign policy. Erosion of well paying jobs transplanted from the U.S. to emerging markets, which were not replaced by any productive activity in the U.S. economy, have left many U.S. workers making a choice to go deeper into debt to try to maintain an expected standard of living and keep up with the "Jone's". The Fed zero interest rate policy (ZIRP) encourages the continuation of low interest loans, primarily through securitized assets and indirect lending, which entices the perpetual refinancing and escalation of consumer debt, while forcing savers to reach for yield in risky investments to keep pace with inflation. In spite of increased scrutiny in underwriting by regulators since the 2008 crash, the financial system continues to show an alarmingly burdened consumer carrying a disproportionate share of the load, while on the whole U.S. consumers have shrinking income levels to amortize the debt. As of August of 2014, a visible uptick in the delinquency rates in the current cycle is not yet visible, meaning the stock market is not yet under pressure to fall due to a debt market defaults. However, the excessive leverage that has returned to the U.S. economy should be disconcerting to investors, and when the reversal in delinquency rates does become evident, odds are that the remaining life in the current bull market will be very short. Overall mortgage debt has finally shown a stoppage of the downturn in mortgage balances (de-leveraging that occurred mostly through foreclosures and fire sales) that began in mid 2008. 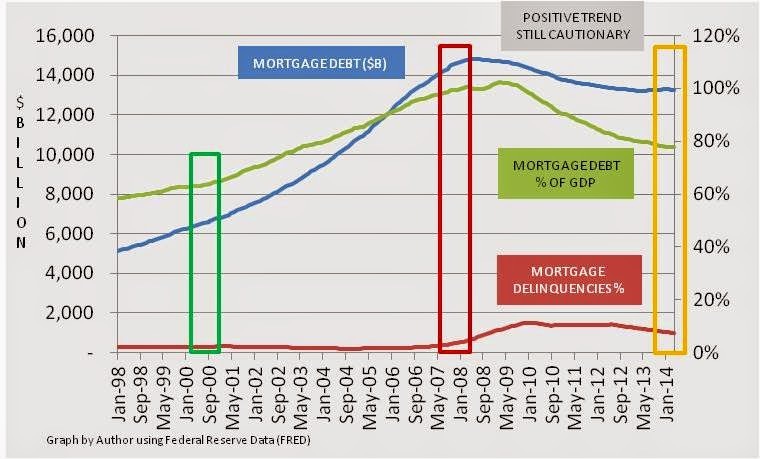 Mortgage debt outstanding peaked in 2008 at $14.8T, and relative to the U.S. GDP was over 100% in magnitude. The mortgage market is very large, and ensuing declines after the crisis have been a major drag on the economy. Mortgage lending presently continues to trend lower as a share of the economy relative to 2007, but still has a long way to go to get back to the levels in place in the 1990s. Mortgage loan delinquencies are also trending lower, but remain historically high. The current excessive liquidity in the financial system is very likely covering up weak links as loans are rolled over and re-financed in the hope that the future will change. Weak loans will eventually be exposed in a tightening Fed environment. 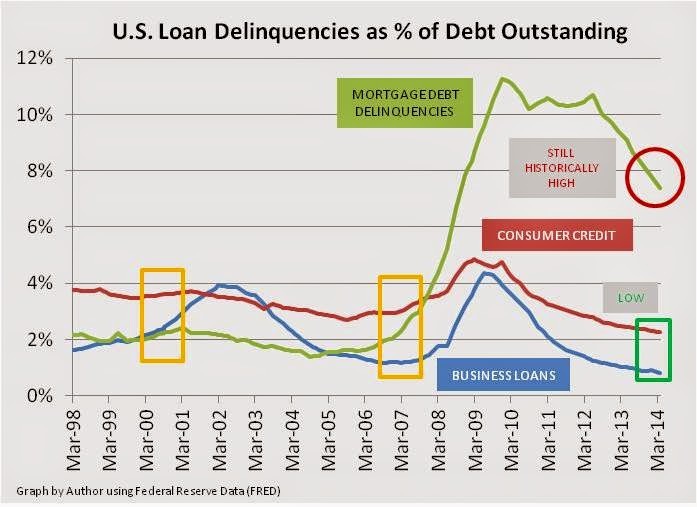 Because loan delinquencies are indicators that can be masked until the trouble is beyond repair, if the market becomes fixated on a particular market segment like it did with the bankruptcies in the telecom and internet sector (remember Enron, MCI and others) in the year 2000 and the mortgage sector in 2008, this would be a time to be very concerned about your equity positions. Presently the only evidence of market concern that I can find about excessive risk taking in the lending markets can be found in Janet Yellen’s recent congressional testimony concerning the high yield business loan market. This time around I suspect the ticking time bomb will be in one or all or the following markets: small to mid-size leveraged loans, consumer auto credit and student loans. One canary in the coal mine might also be exhibited if defaults begin to materialize in the energy boom sector, particularly in the exploration and production sector. As the Fed backs away from the unprecedented quantitative easing (QE3) policy which began in early 2013, liquidity chasing poor quality loans will dry up, and the weak links will begin to be exposed. As this happens, look for the equity bulls to hit the sell button. Daniel Moore is the author of the book Theory of Financial Relativity. All opinions and analyses shared in this article are expressly his own, and intended for information purposes only and not advice to buy or sell.